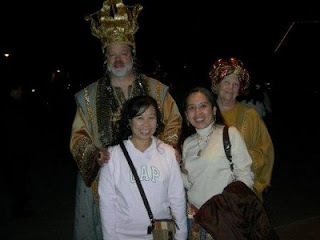 The characters in the play, King Herod and wife. We had a lucky chance to be with them in the photos. I am with my cousin Pearl. It was such a perfect timing for us to visit Crystal Cathedral on December 11, 2008 because it was one of the days they were showing "The Glory of Christmas", - a stage play that comprised 15 acts narrating the story of the Holy Family until the Messiah was born and praised, done through singing, dancing and acting. "The Glory of Christmas" had been an instant family tradition for 28 years which delighted and touched the hearts of over 3 million people who have witnessed it's remarkable story. Cameras and video recordings are not allowed so take photos before the show starts. It was great to see those flying angels looked like they have wings floating on air! And real camels, horses, sheep, etc...have their own acts too! :).